David was an expert sniper. Goliath never had a chance. For all these years our understanding of the story of David and Goliath has been completely wrong. David was a sniper, slinging a rock with the force of a .45 caliber bullet. And, he had the skill to knock birds out of the sky, and kill/maim targets at a range of up to 200 yards. Goliath was big. He was strong. And, he was practically blind. He wasn’t a guy you wanted to wrestle with. Not surprisingly, David had no intention of hand to hand combat. 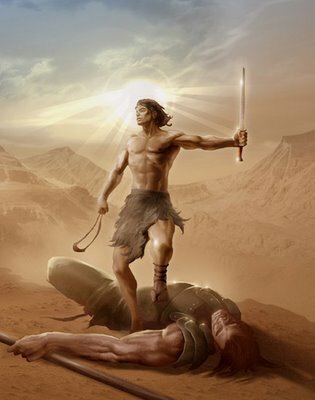 He took out Goliath the same way he had taken out countless ferocious animals before – with a sling and a rock. We watched a video tonight of Malcolm Gladwell, author of many book such as Tipping Point, Blink, Outliers and others. His latest book, David and Goliath: Underdogs, Misfits, and the Art of Battling Giants, is a great read. The opening story, which Gladwell retells in this video, is about the real story of David and Goliath and the lessons we can take from how it really happened. Just like the meeting we did before Christmas – Jesus or Santa Clause, Which is the Reason for the Season? – this video has the potential to be a real buzz kill to our long held beliefs. The consensus, though, was that it actually amplified many of the values that the original interpretation contained. Plus it opened up the opportunity for many more life lessons to come from the story. Rather than simply being a story about a single moment miracle, it is a story of a life of preparation, recognizing when it is OUR turn to take action, viewing seemingly insurmountable obstacles from an unexpected angle. Thinking outside the box. In typical HolySmokes style, the new interpretation allowed for us to insert ourselves into the story in new a revelationary ways. What if instead seeing ourselves as David we were actually Goliath? Arrogant. Overly Confident. Invincible. Unaware of our own devastating weakness. Are we, ourselves, just a stones throw away from being taken out? In business? In relationships? Many of our guys were able to articulate the ways they might be acting like Goliath. « Jesus and Santa Claus. Which is the reason for the season?